Le Cape: South Africa's hottest new luxury lifestyle event, a first of its kind was born out of the appreciation of the finer things in life. 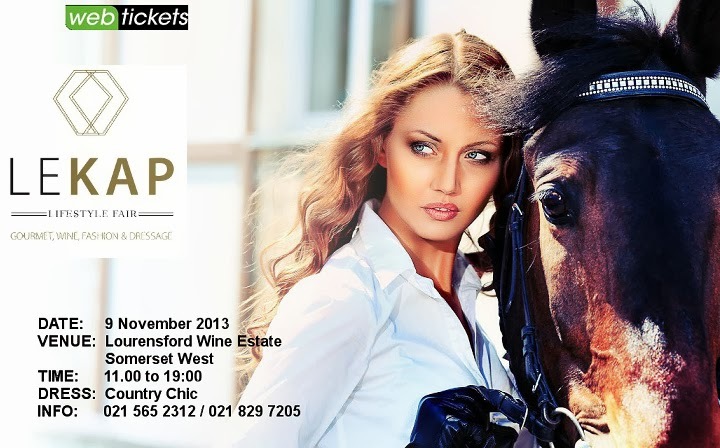 Gourmet food, artisanal drinks and fine wine meets fashion, dressage and showjumping. Join celebrated South African chefs, Bertus Basson, Brad Ball, Grégory Czarnecki, PJ Vadas and Gustaaf Boshoff as they showcase their talent from an exhibition kitchen. Hot on the heels of international food trends, third generation Naples chef, Luca Castigklione, of Cape Town Food Trucks will be joined by a caravan of other leading food trucks. They have reinvented the way South Africans experience fresh, local ingredients in a stylish yet informal environment and brings to the Le Kap Lifestyle Fair a new take on 'gourmet style' street food.